Place by Design is SXSW’s public space design competition, celebrating transformative work at the intersection of art, technology, and design that repurposes our everyday surroundings and provides new meaning to our built environment. 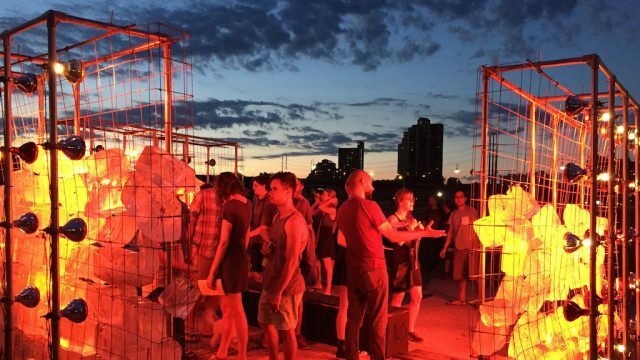 Place by Design provides a platform for artists, architects, designers, and urbanists at all levels to present their scalable solutions for improving our shared landscape (including public art, urban interventions, digital technologies, and architecture). Applications are currently open through October 13, 2017. The selected finalists will be invited to present at SXSW 2018 in March at the Cities Summit. Each designer or team will present their work in a fast-paced pitch competition and participate in a Q&A session with the judges, who ultimately determine the winner. The Place by Design competition is open to all types of design work that rethinks, enhances, or transforms public space, including but not limited to emerging technologies, urban interventions, public art, and architecture. Check out presentations and work of previous year’s participants here. Register for SXSW 2018 by Friday, October 20 and save. Make your hotel reservations through SXSW Housing & Travel for the best available rates. We hope to see you in March!